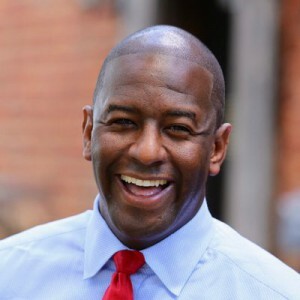 Washington, D.C., Oct. 22 – Florida Gubernatorial Candidate Andrew Gillum responded today to RespectAbility’s #PwDsVote Questionnaire for the 2018 Midterm Elections. The current Tallahassee Mayor outlined his plan to improve state services for the 2,785,900 Floridians with disabilities by addressing issues such as long waiting lists for the Home and Community Based Waiver. According to a recent survey, 74 percent of likely voters have a disability themselves or have a family member or a close friend with disabilities. The upcoming elections and their results will have an impact on people with disabilities, so it is important to become familiar with the candidates’ thoughts on certain issues. RespectAbility also has reached out to Gillum’s opponent, Ron DeSantis, Congressman for Florida’s 6th congressional district. The office has yet to receive a response, according to the organization’s President, Jennifer Laszlo Mizrahi. RespectAbility is nonpartisan and does not endorse candidates. The questionnaire is purely for educational purposes. First and foremost, Floridians with disabilities deserve the same rights afforded to all Floridians. Most importantly, they must be given the ability to live independently within their chosen communities, and the opportunity to seek out and achieve their dreams and desires. Government plays an important role in supporting and ensuring this fundamental right. We must do a better job in this regard. There are specific steps we can take to make our state a better place for people with disabilities. First, we must get a handle on the waiting list for services within the Home and Community Based Waiver. Too many Floridians have been denied critical services due to a lack of political will. This program is a lifeline for our most vulnerable citizens and their desire to live productive lives. The same can also be said for the Agency for Persons with Disabilities (APD). APD is filled with some of the most dedicated and hard-working public servants in the State of Florida and I look forward to giving them the necessary tools and funding to carry out their important mission. These people are on the front lines of the care continuum and I will not overlook the important role they play. Finally, it’s essential that we connect people with disabilities and their families with the information, training, and resources they need to thrive in the community. That includes continued support for efforts that are unique to Florida, as well as a strong commitment to empowering the key state agencies that serve Floridians with disabilities, and the dedicated, hardworking public servants that help them carry out their important mission. I look forward to partnering with advocates in both the public and private sectors to help Floridians with disabilities be successful. I am all too aware that families who deal with challenges like these are already stretched to their limit, both emotionally and financially. Florida can do better, we must do better. RespectAbility has asked all the candidates for Governor on both sides of the aisle to complete the same questionnaire. We will share responses from additional campaigns as we receive them. The RespectAbility Report is a nonpartisan political commentary on U.S. elections with a focus on disability issues. The RespectAbility Report first posed this down ballot questionnaire to candidates in 2016 while covering all of the 2016 Democratic and Republican candidates for president. Coverage of this and related issues can be found at http://therespectabilityreport.org. The RespectAbility Report is nonpartisan and does not endorse candidates.